As Palestinian, Israeli and international networks and organizations concerned with human rights, we write today in the hope that you will stand by each of your corporations’ respective written commitments to upholding human rights as illustrated by the two above statements from your own websites. As the two corporations sharing the HP brand it is incumbent on both HP Inc. and Hewlett Packard Enterprise (HPE) to end the HP brand’s long involvement in violations of Palestinian human rights and provide public and verifiable proof that this complicity has ended. We recognize your stated commitment to corporate social responsibility, but these statements ring hollow as long as you contravene your own statements by continuing to support and profit from the violations of Palestinian human rights and international law. The contract to maintain the Basel system used to restrict Palestinian freedom of movement at military checkpoints in the occupied West Bank. All contracts with the Israeli military, which carries out the military occupation of the West Bank, including East Jerusalem, and the deadly blockade of the Gaza Strip -- including the supply and maintenance of PCs, servers, IT systems, and other technical support. All contracts with the Israeli government related to its population registry and biometric ID and passport systems, which is the mechanism used to enforce Israeli apartheid under which different categories of people under Israeli control have different sets of legal rights depending on their ethnicity and religion. All contracts with Israeli prisons, which are sites of widespread and well-documented torture and abuse of Palestinians, including of children and political prisoners held for years without charge. All business activities with the municipal governments of illegal Israeli settlements in the occupied Palestinian West Bank. All business presence in illegal Israeli settlements and all business collaboration with businesses in illegal Israeli settlements. We are hopeful that HP corporations are moving in the right direction. If this is in fact the case please provide publicly verifiable evidence to this effect. Following HPE’s spin off of DXC Technology which could inherit certain contracts with Israel, HPE’s 3 April 2017 statement, “HPE will also maintain a strong relationship with DXC, with agreements in place to support current customers and to grow business over time.” is particularly concerning. Churches, trade unions, local councils, student governments, and many other civil society entities worldwide will continue to hold HP-branded corporations accountable in diverse ways, including divestment, boycott and institutions declaring themselves HP-Free Zones. It is therefore in the best interest of your corporations and your respective shareholders to ensure that the companies sharing the HP brand publicly and verifiably end all involvement in the restriction of Palestinian human rights. We look forward to a response at your earliest convenience. HP-branded companies have been in receipt of large government contracts for systems and services with Israel across areas of civil and military administration. These HP systems and services constitute material support of Israel’s flagrant breaches of the Fourth Geneva Convention and international human rights conventions. They are incompatible with HP’s binding obligations under the UN Global Compact and the UN Guiding Principles on Business and Human Rights to respect International Humanitarian Law (IHL) and human rights. These systems and services could, moreover, implicate HP companies in aiding, abetting, or assisting in war crimes and crimes against humanity such as indiscriminate and deliberate use of armed force against Palestinian civilians, torture, apartheid, and forcible transfer of populations; as well as breaches of the United Nations Convention on the Rights of the Child, the International Covenant on Civil and Political Rights, and the International Covenant on Economic, Social, and Cultural Rights. HP-branded companies have contracted with the Israel Prison Service (IPS) to provide and maintain servers in prisons and to design and implement human resource and prison management systems. Israel has a widespread and well documented history of unlawful arrest and detention of Palestinians, denial of fair trial rights, and ill-treatment and torture of Palestinian prisoners, including children. With these practices, Israel is in breach of multiple provisions of the International Covenant on Civil and Political Rights, the Convention against Torture, the Convention on the Rights of the Child, and the Fourth Geneva Convention. 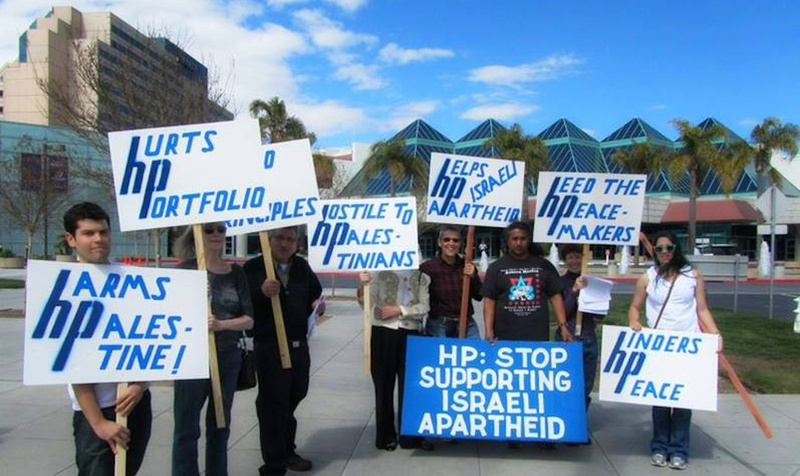 In light of the long history of close HP connections with Israel’s military and occupation prior to and since the HP Inc./HP-E split, the continuation of both corporations to use the HP brand, ongoing corporate restructuring of HP-E, and a lack of basic transparency and responsiveness to public concerns on the matter, it is imperative that all companies using the HP brand clearly, publicly, and completely step away from involvement in Israel’s projects that violate international law and Palestinian human rights by ending all of the above named contracts as well as any ongoing relationship with corporations such as DXC Technology which may take ownership of these contracts from an HP branded corporation. The international Boycott, Divestment, Sanctions (BDS) campaign calling on HP-branded corporations to stop profiting from Israeli human rights violations against Palestinians has been going on for several years. Many campus groups, churches, municipalities, and other entities have targeted HP companies for boycott and divestment including the Presbyterian Church (USA); United Church of Christ; Quaker Friends Fiduciary Corporation; the Unitarian Universalist Association; the Mennonite Church Central Committee; Portland, Oregon’s Human Rights Commission; and dozens of student governments on campuses nationwide including Princeton, Northwestern, and the University of California. More and more church congregations are declaring themselves HP-free. Nearly 1.8 million people have signed a petition calling on HP to end its role in violating Palestinian human rights. Most recently, the National Union of Teachers in the UK, representing about 400,000 members, declared itself an HP-Free Zone. In 2012, prior to HP’s split, UN special rapporteur on human rights in the Palestinian Territories Richard Falk specifically highlighted HP as a recommended target for boycotts due to HP’s ongoing operations with Israel’s illegal settlements. Similar boycotts targeting French company Veolia Environnement and British security company G4S have led to billions of dollars in lost contracts before both multinationals eventually took steps to end or significantly reduce their complicity with Israeli apartheid. The Palestinian Boycott, Divestment, Sanctions (BDS) National Committee helped lead the week of action with participating organizations including Jewish Voice for Peace; American Friends Service Committee; Students for Justice in Palestine; Samidoun: Palestinian Prisoner Solidarity Network; Women in Black; Middle East Children's Alliance; Friends of Sabeel - North America; CodePink; Syracuse Peace Council; Palestinian Rights Task Force; Resource Center for Nonviolence; Christian-Jewish Allies; UUs for Justice in the Middle East; Mass Against HP; LA HP Boycott; Adalah-NY: New York Campaign for the Boycott of Israel; Washington Interfaith Alliance for Middle East Peace; Queers Undermining Israeli Terrorism; Canadian BDS Coalition; Coalition Against Israeli Apartheid; Tadamon! Montreal; The Association of Norwegian NGOs for Palestine; BDS France; BDS Switzerland; BDS Italia; BDS Berlin; Plataforma Solidaria con Palestina de Valladolid; Palestine Forum Japan; BDS Netherlands; Ireland Palestine Solidarity Campaign; BDS País Valencià; BDS 67-Collectif Judéo Arabe et Citoyen pour la Palestine; BDS Malaysia; International Movement for a Just World; Australian Friends of Palestine Association; Red de Solidaridad con Palestina Costa Rica; BDS Colombia; BDS Mexico MX; Jovenes con Palestina; Federación Palestina del Peru; Palestine Solidarity Campaign - UK; the US Campaign for Palestinian Rights; and more than 50 other organizations.